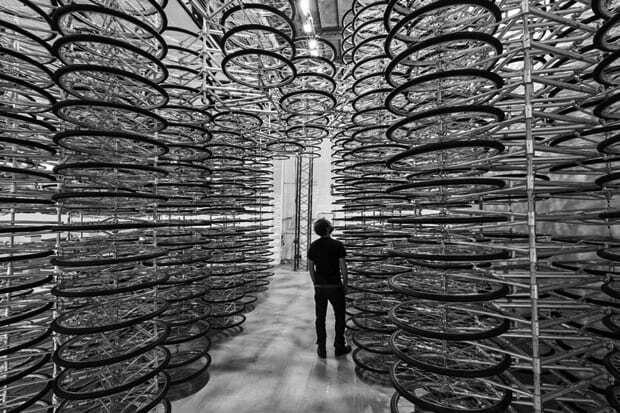 Much maligned by the Chinese government, controversial artist Ai WeiWei presents "Stacked," an installation of 760 bicycles displayed at GALLERIA CONTINUA. A continuation of 2008's "Very Yao," "Stacked" draws upon the favored mode of transportation for millions of Chinese and is an exploration of mass manufacturing in his native country. Each of the bikes featured in the exhibition is produced by Forever -- the most ubiquitous brand of two-wheelers in China -- and systematically arranged, form the skeleton for an abstract representation of the country's workforce. "Stacked" will be displayed at GALLERIA CONTINUA's San Gimignano Gallery space until February 16.